Hamilton Academical chairman Les Gray is adamant that "artificial pitches are here to stay". And he is calling for the same standards applied to synthetic surfaces to be introduced for grass parks, describing some as "mud heaps". PFA Scotland want further research on the impact of artificial pitches, with the union saying "players are the experts here". "Why are we not failing grass pitches that are below standard?" asked Gray. 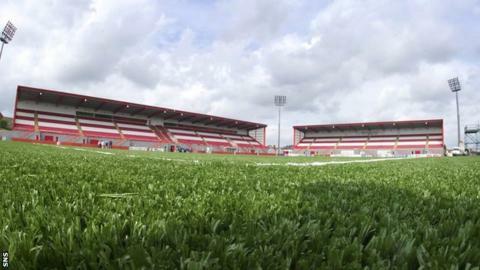 Hamilton have had an artificial surface installed at New Douglas Park since 2004. ''We've spent a lot of time, money and effort looking at all the comparisons in terms of injuries and sustaining injuries against grass," Gray told BBC Scotland. "We've looked at all the Fifa measurements that are requested of us and I would implore our league to now have a look at what we are doing to measure grass because a lot of the pitches we play on are not of good quality and would not pass any of the tests we are required to. ''We've played on pitches recently where the ball didn't bounce. "There is no criteria to measure grass, there is a rule which says they have to be flat. Well we all know that they aren't all flat." Twelve of the 42 SPFL clubs play on 3G surfaces, and in 2013, the Scottish FA requested a survey of PFA Scotland members on the subject and more than 700 players replied. The vast majority wanted to avoid artificial surfaces, with 73% of players saying they would prefer to play on a "deteriorating grass pitch" rather than a plastic one. PFA Scotland's Stuart Lovell told BBC Scotland: "Our position has always been that we would like our member's views to be vocalised. "It would be a good time to have a discussion about where we are with 3G pitches. "The players are the one who have to do their job on these pitches and they need to be listened to." The SPFL have yet to receive any official complaints from member clubs about artificial surfaces so say they have no need to comment at the moment. Gray also baulks at the suggestion injuries are more likely on an artificial turf. ''There is no evidence to say they cause injuries. I'm not concerned about injuries. I'm more concerned about getting our pitches playable. "Fifa say it's okay, they play internationals matches on artificial surfaces." Gray is also confident there will be more artificial pitches in the future. "Obviously there are different types surfaces and different business models - we don't rent our pitch out at all," he explained. "The weather in this country, together with the size of clubs and number of clubs is going to lead to more of these pitches. We continually get calls from other clubs asking about the cost and maintenance." BBC Scotland pundit Pat Nevin has warned though that artificial pitches do not replicate the game played on grass. "I'm not a big fan of artificial pitches, purely because the game is very different played on them surfaces," said the former Chelsea winger. "It's difficult to do a particular type of skill - tricks, dribbles and stuff like that - on that sort of surface. I enjoy watching a game played on grass more. "Below the top level where the game is a bit slower, the pitch works quite well. But at the top level when its played at the pace its played at, it can be very different. "I would hope it's not the future because it's an entirely different game."